Sommets Charlevoix offers more than 40 cottages divided in 3 categories: rustic, classic and modern. Each chalet has all the amenities you need for an unforgettable stay and most of them offer an amazing view over the Saint-Laurent river. Our classic condos and chalets have a more modern decor than the rustic ones and strike out with their more spacious kitchen. Our modern chalets offer you a contemporary decor and an amazing view over the Saint-Laurent river. Make the most of your stay in one of our cottages with the promotion of the moment: 3rd night for free! There’s so much to do in Charlevoix! Charlevoix is a wonderful region full of breathtaking landscapes where you can discover regional artists and enjoy locally made products. Furthermore, many locations offer you the possibility to practise your favourite outdoor activities! 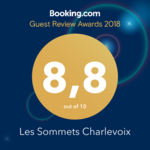 During your stay at Sommets Charlevoix, you will experience nature, culture and gastronomy.